Having spent the last 20 years working in watercolour I gradually became frustrated that my work was not developing. 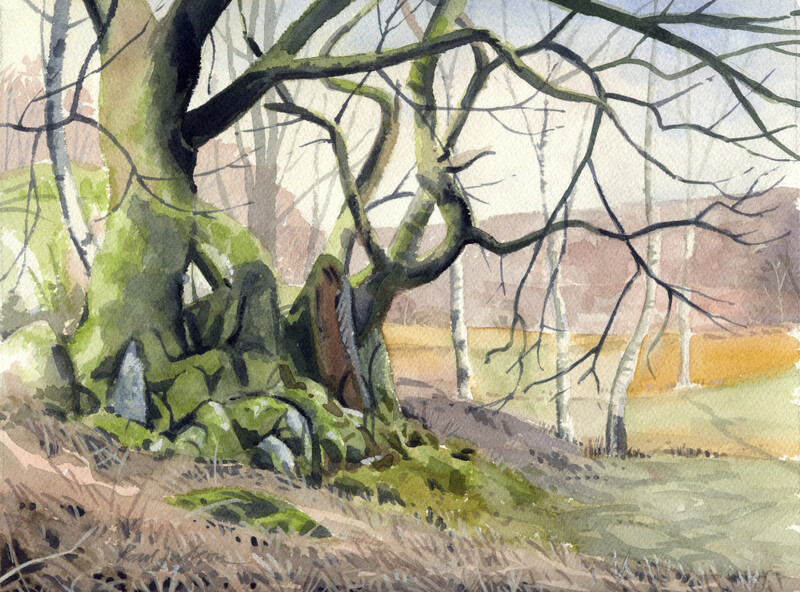 I had always been fascinated by the effects of light in a landscape and enjoyed the way that watercolour was able to capture the qualities of light and shade. But, I was also finding that I was increasingly using photography in creative ways to achieve the same effects. I now realised that I wanted to use colour in a more creative and expressive way, rather than being confined to simply imitating nature. 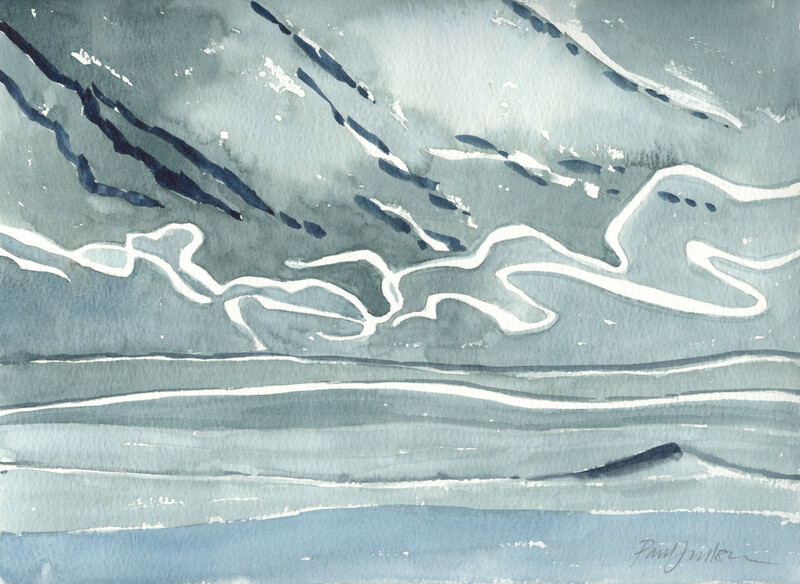 And I was very fortunate to be given a three month sabbatical in 2007 which gave me the freedom to begin to explore what that could mean for my work. I was also interested in exploring the relationship between creativity and spirituality and there is more on that in the notes I made at the time – see Sabbatical notes. I had approached the sabbatical with a completely open mind whilst being very conscious of the fact that I was embarking on a journey of discovery. 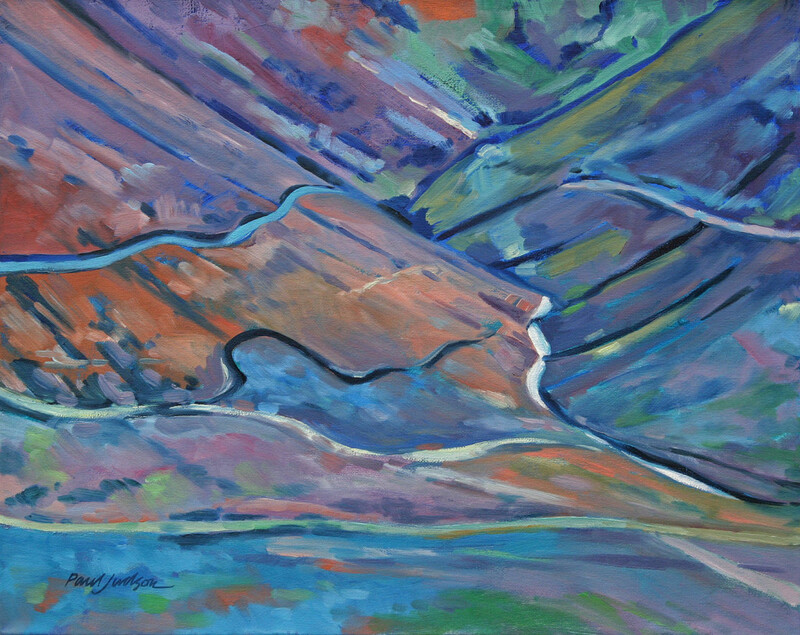 And one of themes which developed during that ‘journey’ was ‘pathways’ One of the ‘pathway’ pictures began with a series of studies (two of which are above) of the view looking down into a valley with a road and a meandering stream. 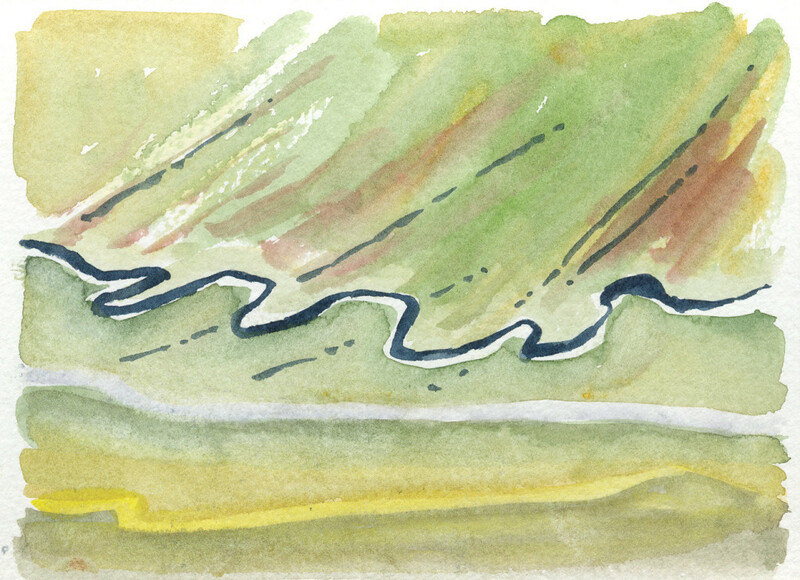 I was intrigued by the relationship between the meandering line of the stream and the straighter line of the road and it occurred to me that it would be interesting to try a reverse image overlapped on the original. 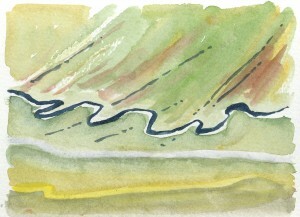 As I worked on the idea it came to me that the lines of the road could represent the basic, underlying tune while the overlapping lines of the stream could suggest overarching notes – two instruments interweaving with each other – hence the title – one of my favourite pieces of Bach’s music – ‘Concerto for Two Violins’. Another of the pictures which made use of similar elements was ‘Never Ask of Us Where’ (above). The title is a line from a poem by RS Thomas and the reason for calling it that was that I felt the repeated lines or ‘pathways’ had given the picture a sense of confused direction. Although the shapes in the landscape and folds in the hills are still an important element in the picture, the main emphasis is on achieving a balance of colour and tone. 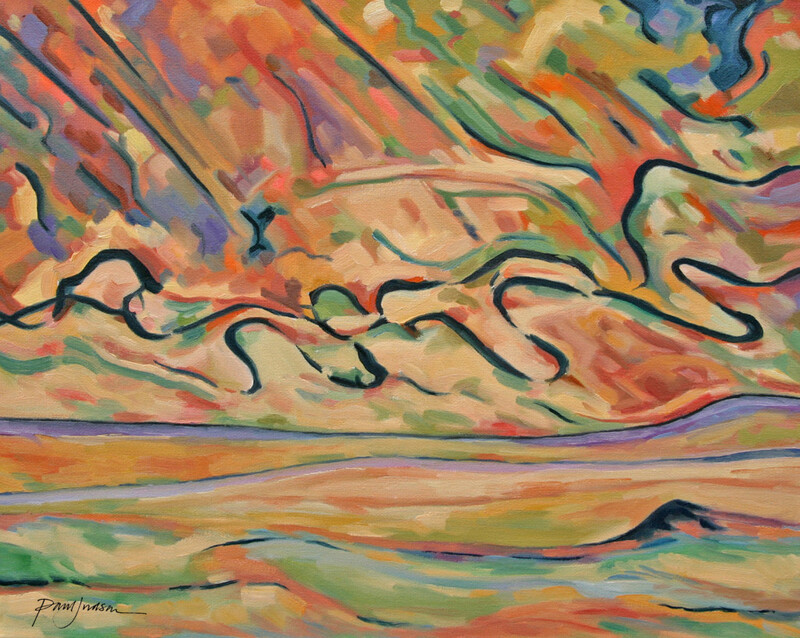 This picture was painted quite early in the sabbatical and in the process I discovered an exciting freedom, not only in the use of colour but also in the way I applied the paint. 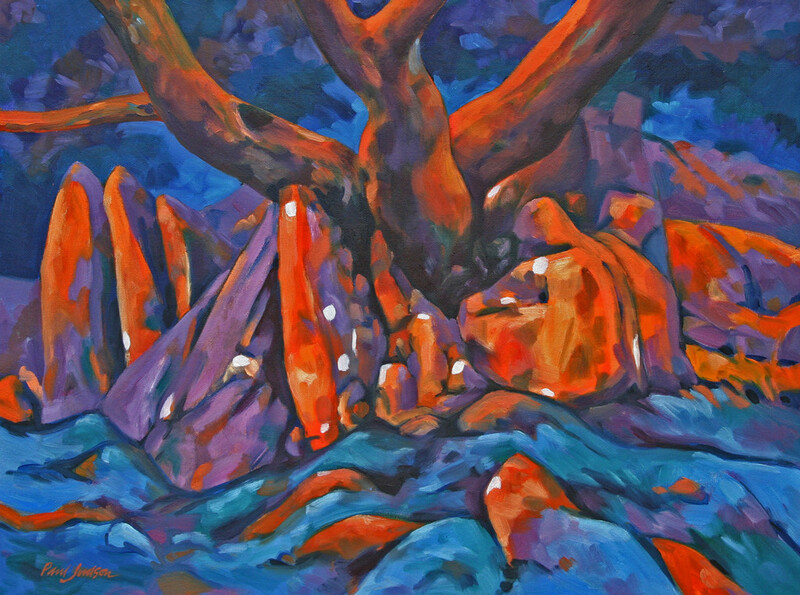 ‘This Tree Rocks (The Council Tree)’ This first picture almost named itself with the play on words while the contrasting reds and blues suggested something vibrant and energetic. 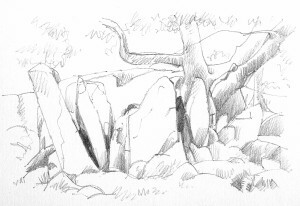 Also the rocks gathered around the base of the tree is suggestive of a group of seated figures, almost paying homage to the tree – hence the subtitle. During a visit to Lesotho we had been taken to see a tree on a high plateau where the leaders of the Basotho people had used to gather and hold discussions. It was the place where Lesotho as an independent country was born and the picture reminded me of that special place. 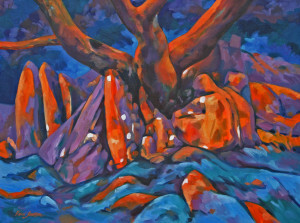 ‘Fantasia on a Theme (Rocks and Trees)’ In the second picture I deliberately softened the colours I was using with the result that it has a slightly mystical, romantic appearance. 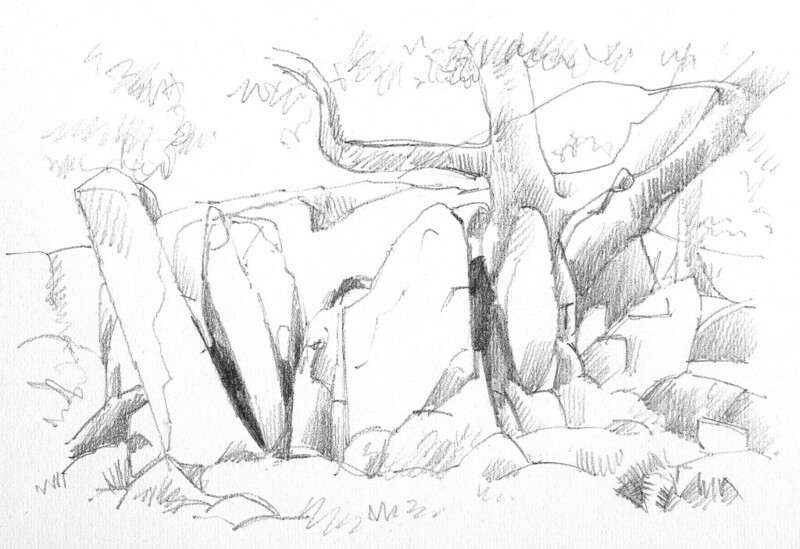 I was also very conscious of wanting to make the foreground of the picture integral to the whole. Foregrounds are something that I have often found difficult to resolve. The foreground of a picture is usually vital to the composition as it leads the eye through to the main subject. The colours, tones, textures etc are not just there to fill up the space and yet I have often struggled to avoid just that – filling up the space. The result being that sometimes the foreground can dominate the picture. 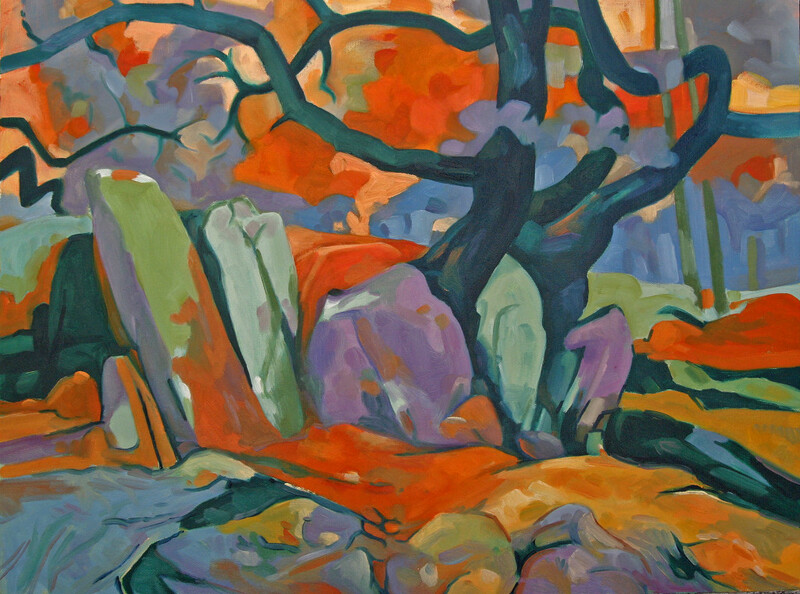 With this painting I worked hard to get the foreground right and I love the sense of rhythm I’ve achieved with the ground flowing and moving towards the rocks and tree.